Do you have those baby carrots lying in your fridge that you don’t want to munch on? Well, here is a truly delicious salad with the goodness of carrots tossed with some greens. I had a roasted carrot salad at a restaurant recently and just loved it. It was so good that next time I also took my husband, who is not a salad person at all and he loved it as well. Pre-heat the oven at 350° F. Start with creating the marinate for the carrots. In a mortar, add garlic, cumin seeds, coriander seeds, peppercorns, lemon zest, sea salt and make a coarse paste. Then mix the coconut oil and maple syrup to this paste. You can use a blender if the mortar is not handy. Toss the baby carrots with this spice paste and bake in the preheated oven for about 30 – 35 mins. Combine together all the ingredients for the dressing and mix well. 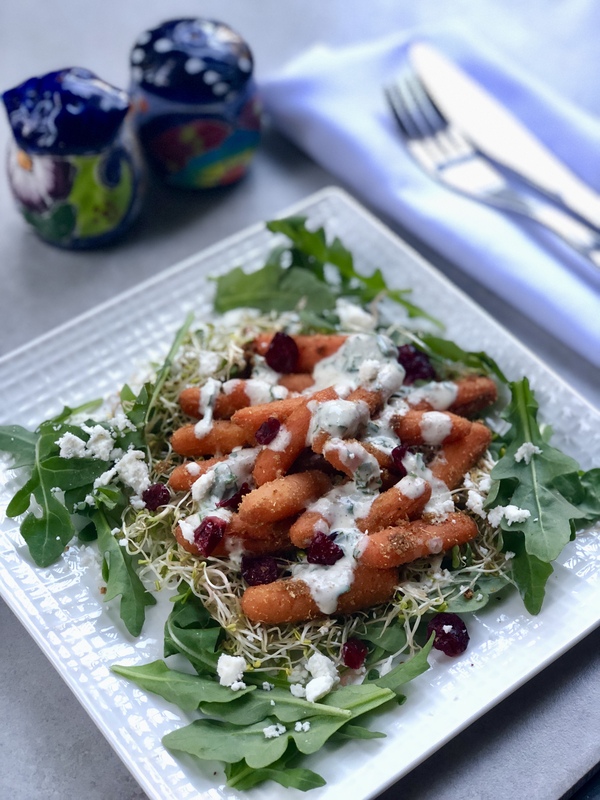 Once the baby carrots are roasted, lay them on a bed of arugula leaves and alfalfa sprouts, add the dressing and drizzle with some dried cranberries, sunflower seeds, feta cheese, nuts and serve while the carrots are warm. You can also roast the carrots ahead of time and store it in the refrigerator. So why wait, turn that boring bag of carrots into a delicious meal tonight!